Feeling fresh for Spring doesn’t have to be complicated. Keep it simple, natural and radiant with these three new Five Minute Face Essentials. 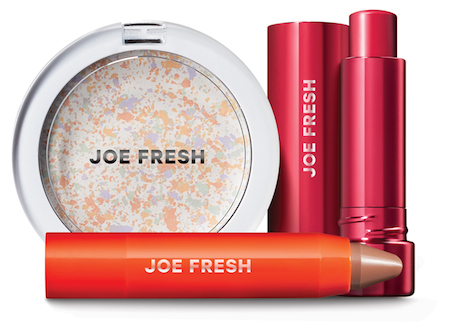 Start off by evening out your complexion with Joe Fresh CC Translucent Powder. With four corrective colours in one compact, the CC Translucent Powder gently evens skin tone for a subtle and natural skin finish. Applying with either a brush or a sponge, this powder absorbs excess oil and keeps skin looking fresh. Next, amp up your brows with the Joe Fresh Jumbo Brow Crayon. This creamy brow pomade provides high definition payoff in one universal shade. It sculpts, tames and defines in just a few strokes to create the perfect bold brow. Finish the look by adding a pop of colour with the Joe Fresh Tinted Lip Balm. With extracts of rosehip, maracuja and avocado, this balm moisturizes and rehydrates chapped, damaged lips. This treatment will soften your lips and complete your rosy fresh springtime look!